As mentioned in the other thread, the products shown when browsing are currently sorted in a manner that those making the most money to tindie will be shown first. Several of my products recently got sold out and therefore are available through backorders. I just noticed today that they are nowhere to be found when browsing through the products, even though they always were in the first pages. So from a seller perspective, I get it that you want your products as visible as possible. From a customer’s view point, it gets very annoying when so much of the top products are sold out. That is a very very (very!) bad idea. Most sellers like me only produce a batch when we see that there is interest in our products. Why not leave products on backorder available for browsing for 14days after they’ve been sold out? Maybe you’d only allow this for top sellers? Now I strictly have no idea if I should launch another batch as I’ve no way to “test the market”. If you look at my seller history you’ll see that many of my sales were done this way. Most sellers like me only produce a batch when we see that there is interest in our products. Ever wonder how many sales you’re missing out on using that method of market evaluation? The average buyer doesn’t want to sign up for a wait list for who know how long unless they REALLY want your product. I know I don’t do the wait list thing. If the item is in stock, I buy it. If there is a wait list I will look elsewhere. You have been at this since the beginning of Tindie and have established product. With that in mind I would think that you should be able to predict your market and inventory levels quite well. I bet you would be surprised how much more you sell if you invested in keeping a small inventory. Well it already happen to me that I had a few dozen backorders in less than 1 or 2 weeks… I’d be interested in your experience, which makes you say that. I don’t assemble my products by hand and am therefore constrained to launch batches of 50 at least. These therefore represent a considerable investment. I bet you would be surprised how much more you sell if you invested in keeping a small inventory. …batches of 50 at least.These therefore represent a considerable investment. An investment for a couple weeks? Sounds like one with a great return. Oh you got me there… good one. I guess a buyers perspective isn’t worth anything. I’m not trying to tell you how to run your store/business, just voicing my opinion. Take it as that. This last sentence seems to express a fact when it actually is just an assumption. If you were a seller then I would have blindly trusted you as you’d have had experience with this particular point. We sellers need facts and real numbers to make informed decisions. If you were a seller then I would have blindly trusted you as you’d have had experience with this particular point. I guess because I don’t “peddle my wares” on Tindie negates the 15 years of selling experience I have. (Shrugs shoulders) Seriously, do whatever you want. Just don’t whine then things change and your gravy train runs out. Well I’ll lay it out for you. Since I don’t have your actual numbers you can substitute them after. 391 orders and I missed that… thanks! The reality is customer needs MUST be balanced with seller needs. That is the fine balance I walk, and regardless of a few backorders, the other 99% that don’t backorder a specific product should have a good experience. Is one order worth the well being of the other 99% who came to browse? How many disgruntled customers are worth a backorder? At the end of the day we need to have a great experience for all so they tell their friends, and that grows the pie for everyone. @Limpkin I get it that you want as many backorders as possible before ordering another run. My goal is to eliminate as much of that risk as possible but in a way that makes sense for the entire community’s long term growth. Seems you answered your own question. Actually not really as many as possible, but at least a few so I know there is a continued interest. Why not compromise between showing them and not showing them at all? Maybe just showing them for one or two weeks after they’ve been sold out? why not only the recently sold out? Don’t misunderstand me, it’s great… but still, you made a good point earlier. How’s the experiment going so far? We’ve actually dug a bit deeper. We’re working with a data scientist right now who has been analyzing data throughout the marketplace to better understand what impacts a product’s potential to sell. After digging into the data, turns out backorders do very little to impact a product’s potential to sell. After turning on backorders, a product sells very, very little - almost none. 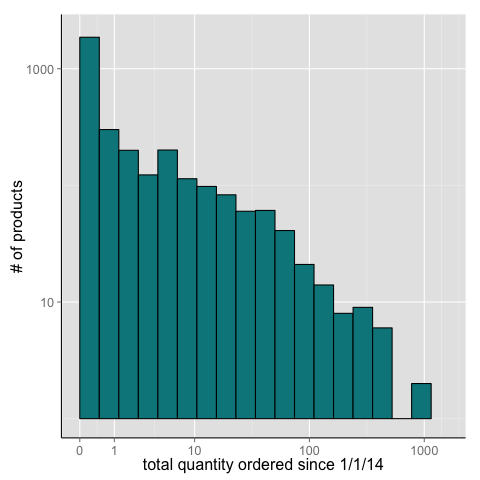 It seems that customers don’t like backorders - or at least don’t do it nearly as much as when the product is in stock. Because of that difference, it may be that backorders hurt a product’s longterm success. Displaying the ‘Join the waitlist’ button is the alternative. With the waitlist, customers buy in mass - and very quickly- once a product comes back in stock. My guess is fear the product will sell out again. It’s a question of keeping backorders (and the few orders that come in while a product is soldout) vs default waitlist and the flurry of activity that comes once a product is back in stock. Hard to compare those against each other - but we know for a fact that backorders do very little across the marketplace. After digging into the data, turns out backorders do very little to impact a product’s potential to sell. After turning on backorders, a product sells very, very little - almost none. Interesting! I must be the counter-example then :). I had quite a back orders these last days… but I guess mainly because I mention that the product is in production. So the waitlist replacement is actually going to be the same thing like backorders only the customer will have to visit Tindie again and make the order. Or you can make an “automated waitlist”, where customer joins the waitlist and when the product becomes available, it will automatically make the purchase for him. Oh wait no, that would be a backorder. And for the data analysis. It is interesting. The things like good description, informative and nice photos and catchy title surely help. But isn’t something missing? Isn’t a product selling primarily because it does something useful? Isn’t the product itself the most important thing? I fully support the demand for clear photos and informative description. That being said, data analysis can turn into cargo cult quickly. And a little off-topic, if I may. What about those custom works. Now with 14-day shipping time, it is very hard to fulfill custom requests (in my case). What if there was a possibility to extend shipping time specifically in case of custom work orders.